The Barn Owl is probably my favourite bird. I hardly ever saw one when I lived in Cheshire, now on my morning patch walks, I see them very regularly. I get a thrill every time. There’s something very enigmatic about them - somehow they don’t seem to belong to quite the same dimension as everything else. Almost as if they’ve slipped through a portal - briefly joining our world from their ghostly homeland - then returning there at the end of the night. 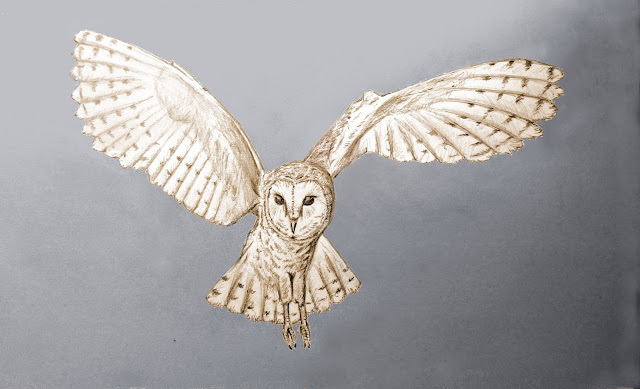 A hunting Barn Owl is a beautiful thing to watch - the slow motion dance of wheeling, flitting and pouncing - all with a wonderful buoyancy - a lightness of touch. I think the word 'grace' was invented for this. I collected some owl pellets from underneath a roosting place which I've been dissecting like a good’un, like an owl-based Gillian Mckeith in fact - only with pellets rather than poop.